Sketches of the monkey-man. Source: cryptomundo.com. In April 2001, three men in the Indian city of Ghaziabad reported being attacked by a monkey while they were asleep. While the first two attacks had happened while the victims were laying on their terraces outside, the third attack occurred in the inside of a building. As the attacks increased, the monkey took on a stranger appearance, with one woman claiming he had glowing light bulbs on his back. Panic broke out across the city, and when rumors began to spread that police had arrested a “monkey man” on April 10th, a crowd gathered in front of the police station and demanded to see it. After only a month passed, sightings of the monkey-man spilled over into the near-by city of New Delhi. The creature seemed to prey entirely on the poor, visiting their neighborhoods late at night and mauling people who happened to be sleeping on their rooftops. Eyewitness descriptions varied widely, with some claiming that the monster was a four foot tall monkey covered in black fur, while others said it was a six foot tall monkey-like creature that wore clothing and had the face of a man. He had everything from an astronaut helmet to a skateboard to the ability to jump from roof to roof without leaving a single footprint behind. Hysteria erupted whenever somebody shouted out that they saw the monkey-man. Three people, including a pregnant woman, died while attempting to escape him, and there were two other incidents in which angry mobs almost killed men suspected of being the monkey-man because one was four foot tall and the other carried a motorcycle helmet. Vigilante groups, feeling the police weren’t doing enough, patrolled the streets themselves. 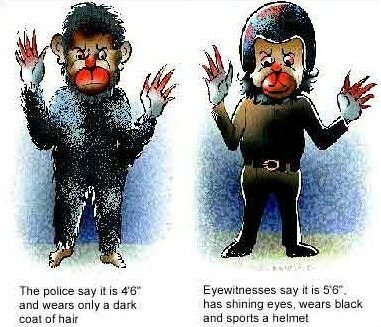 The police, however, treated the existence of the monkey-man seriously, even releasing sketches of eyewitness reports. 3,000 officers were dispatched to the case, instructed to shoot-on-sight. A special task force was assembled and given special vehicles to pursue a monster that could allegedly run and jump at top speed. A reward of the equivalent of $1,000 was even offered to anybody who could help catch the monkey-man. 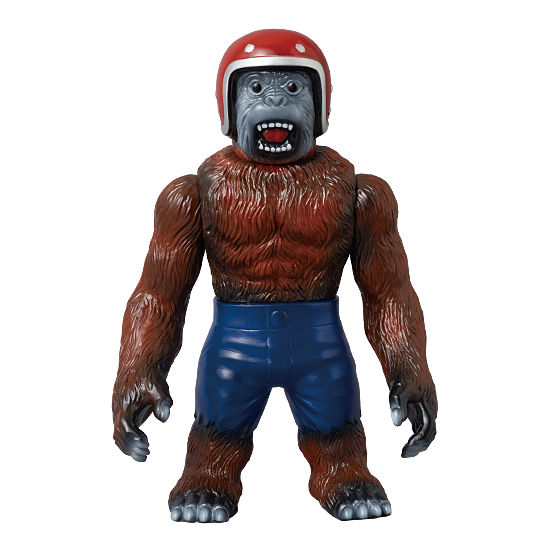 A Japanese monkey-man toy. Image source: mediacomtoytv.com. Meanwhile, Sanal Edamaruku of the Indian Rationalist Association began to investigate and interview witnesses. He found that many of the sightings were inconsistent, some portraying the monkey-man as a phantom monster, others as a sci-fi robot. The scratches and wounds on victims touted around the media as proof turned out to be small and non-serious, caused by mosquito bites and laying on traditional Indian beds. The victims he interviewed didn’t show signs of trauma, but of excitement. The monkey-man, as it soon emerged, was nothing more than mass hysteria. The reports of sightings and attacks stopped as quickly as they started, and life in the city returned to normal by the end of the summer. A movie inspired by the incident, Delhi-6, was released in February 2009. Enjoyed this story? Click here to like us on Facebook to receive creepy news and our latest articles in your news feed.